The quatrefoil design on this wall cross is rich in symbolism. The theme of this cross is about our relationship with our Lord as the "sheep of his pasture" and our own call to "feed his sheep" by taking the gospel to the ends of the earth. Shown with gift enclosure boxed with all crosses that includes full symbolism and information about the artists. To purchase this cross click the purple price link above for a secure online checkout. To save on shipping when ordering multiple items, message me from the contact page to arrange purchases. 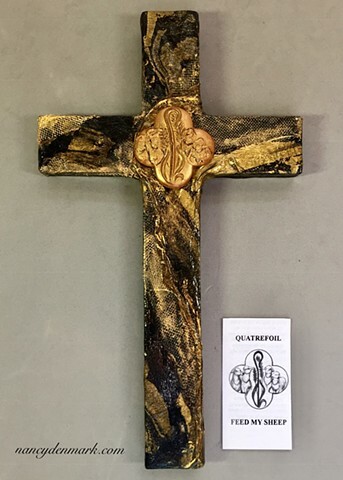 This new larger size cross was made in collaboration with collage artist Patti Reed. Wood cross collage by Patti Reed. Polymer clay symbol by Nancy Denmark.